Where to Eat the Best Gelato in Bologna! One of the things I love most about Italy are those moments in time that seem to just happen - no planning, nothing deliberate. Like when you find the best gelato shop in any Italian town. Yes, I admit it, I have a sweet tooth. And gelato is certainly a traditional Italian food you have to eat while you're in Italy. You can find delicious gelato all over the country, some of the best I've ever had can be found in the small gelaterias in Bologna. It’s not the number of flavors or concoctions offered, nor the amount that’s scooped up in a serving. It’s the beautiful balance of creaminess, sweetness, and taste. Gelaterias are everywhere, though some aren't nearly as inviting as others (I'm not a fan of the ones with colors so artificial they look like heaps of melted crayons). Here are three with the best gelato in Bologna! Our first time to Bologna I was on a mission to find the Holy Grail of gelaterias. My pilgrimage led me to many excellent shops, but then I found it. The one that had it all. The one that had me saying, okay now I’ll try that flavor next. And maybe another...and just one more. Centrally located and easy to find, this gelato shop has a classic ice cream parlor look - bright and alive - and like most I saw, it was small inside, and very quaint. But it’s the gelato, the subtle and intense flavors - strawberry, hazelnut, pistachio, chestnut, Belgian biscotti, and unique chocolates to name a few. Yum!! You can mix and match flavors to your heart's content. They’re all smooth, creamy, and absolutely delicious. If you’re having dinner at a local eatery, skip dessert and head here. Maybe it was enjoying a few scoops while sitting under the endless portico in the warm afternoon sun that had me remembering summer afternoons as a kid with a dripping popsicle. Whatever it was, this is the best gelato I’ve ever eaten, and alone is worth a trip to Bologna just to indulge yourself. We first discovered the Cremeria Santo Stefano on the Taste Bologna food tour, which by the way is a great way to discover the best foods of Bologna. To add to that tempting gelato experience we had last year, we found two new places this year which are excellent and worth a try. Lilasú had the best chocolate gelato we had. So good in fact, that we went back three times in as many days! So what are you waiting for....go! 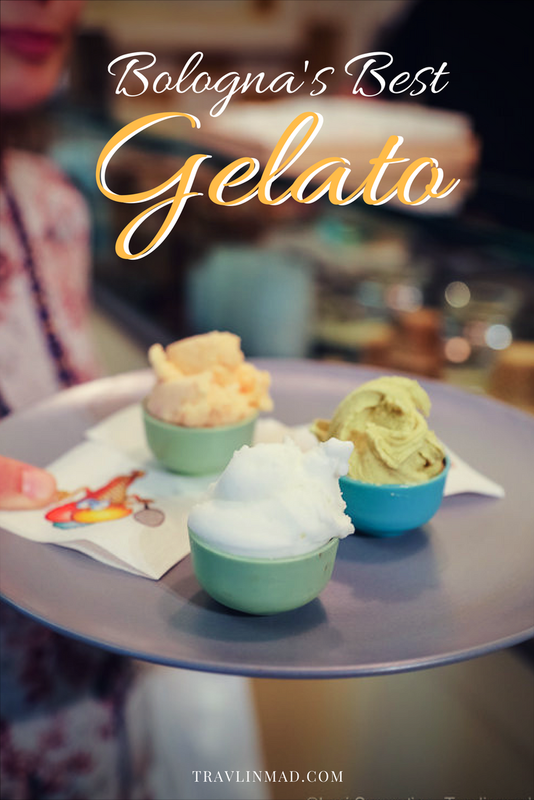 Where did you discover your perfect gelato? or are you still searching!